Over the years we have received for overhaul several dozen airends deemed un-repairable by other airend repair shops. When we slid the cylinder off this one it was clear that, once again, the worst damage was done at the rebuilders shop, not in the compressor failure. In an attempt to push out the male rotor which had seized to the inlet housing of this 200 horsepower airend, the other repair house used too much press and too little preparation resulting in a blown apart inlet bearing housing. With no reference to how the damage occurred, they informed the servicing distributor that their customer’s airend could not be repaired. The customer would need to purchase a new factory airend at full price, because their airend core was not usable, or make the choice to buy a new compressor package. This airend could be repaired, but at a higher cost than if it had been disassembled correctly. 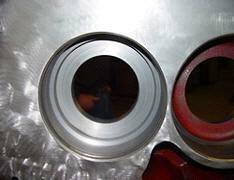 The following are some of the steps in our repair of this expensive (and not sold separately) bearing housing. 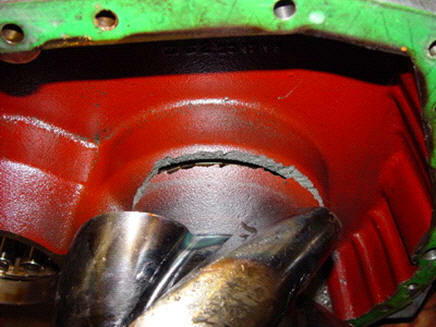 This casting repair required reconstruction of the entire bearing bore and seat. 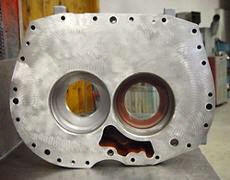 All machining is done in house, and our casting repairs are guaranteed for one full year. 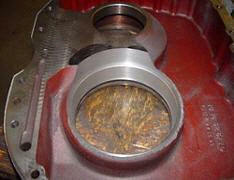 At Air Compressor Technology, we have developed non destructive techniques to disassemble and repair seized airends. By cutting the rotors from the casting in our own machine shop we minimize unwanted fractures and distortion of expensive airend components. 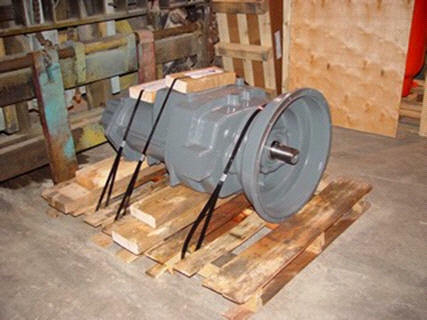 We have learned how to restore cylinder bores without twisting up the castings with excessive heat.Having the option of remanufacturing his customer's air end helped to keep this compressor distributor in control of the sale.